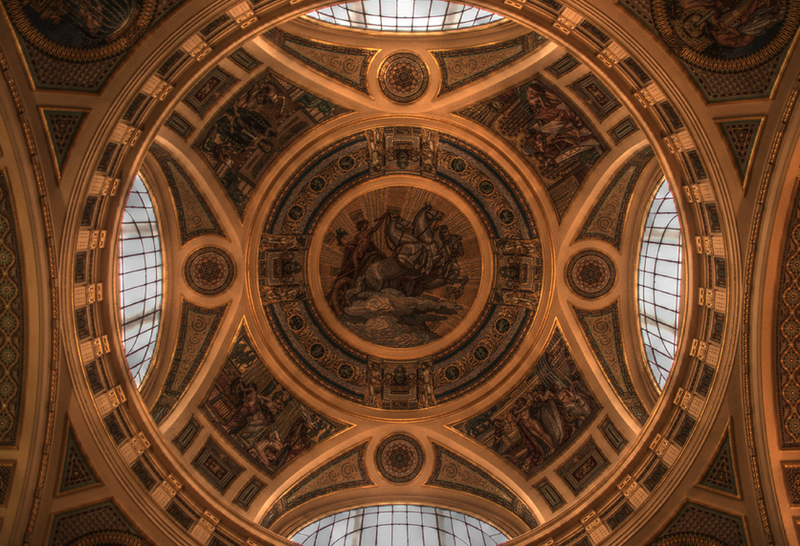 March 15 is a historical national holiday in Hungary, which will slightly affect the opening hours of Szechenyi Baths: the thermal bath will be open as on Sundays. 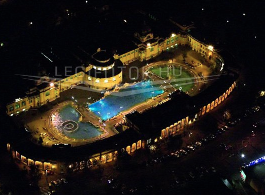 In short, you can come and visit the Szechenyi Bath, the baths, the pools will be open, the massage treatments and other services will also be available. See the exact opening hours below. The ticket prices of Szechenyi Baths will be weekend prices (as on Sundays, and on other public holidays in Hungary) on 15 March. 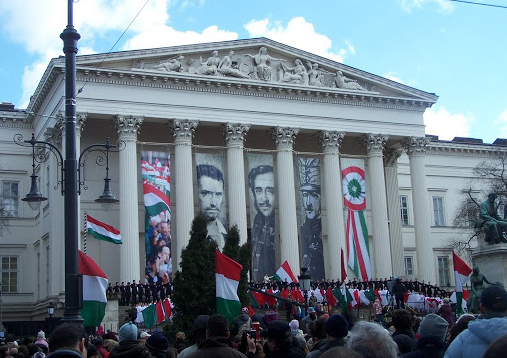 March 15 is a public holiday in Budapest when Hungarians commemorate the hopeful start of the 19th century revolution of 1848/49, a two year battle for the freedom of Hungary from Austria. The freedom fight was lost, many thousands died in the battles, and the Hungarian military leaders were severely punished. But March 15 remained the day of hope, the day of free speech, and enthusiastic acts. On this day, you can see locals wearing flower shaped, little round national flags stuck on their coats (Kokarda), some historical enactments of the March 15 events, students acting out the days of the revolutions, when Hungarian citizens, men and women alike, along with writers, poets galvanized the revolution. Sandor Petofi the poet recited his National Song poem at the National Museum, people ran to the press to print out the revolutionary pamphlets and fliers of the 12 Points of Freedom. Also, the iconic figure of free speech, Mihaly Tancsics, was freed by the crowds on this day. (He was a real socialist minded writer, who was imprisoned in 1847 for his censored writings encouraging the peoples of Hungary to fight for their freedom). I am visiting Budapest with 4 kids. Ages: 9, 13,14,14. 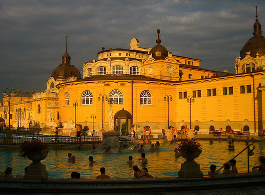 We would like to come to Szechenyi bath, all kids are really peaceful and easy and we are staying together all time. Are kids allowed in your spa everywhere. There is info on your page that they are allowed but before purchasing tickets on-line I want to get an answer from you. Hello Margit, you are welcome to come with the kids at your parental responsibility. 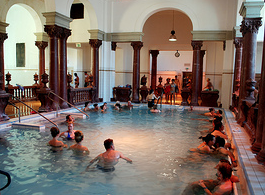 The waters in Szechenyi Bath are recommended for children over 14, for medical reasons: younger children’s cardiovascular system are less able to cope with thermal waters for elongated periods. If you let the children in the water please do make sure they do not spend more than 20 min at a time in the pool. Kids can easily overheat. The private cabin is too small for more people, it is comfortable for one person to get changed and store belongings. If you still want to choose the cabin to keep the family together, you could take turns to get changed by using the same cabin. 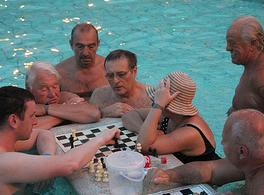 due to the warm thermal waters, you can enjoy the outdoor pools all year round. 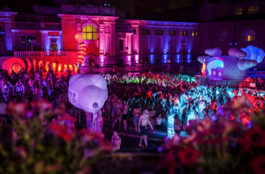 Have a lovely time in Budapest, and if you need any help with your booking please do not hesitate to contact us.